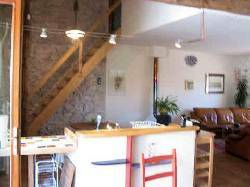 Spacious but simple economical stay in a green hamlet near Pezenas and the Mediterranean beaches. 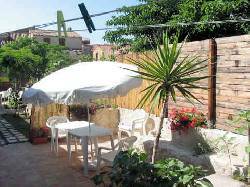 You enter via the 25m² terrace which is furnished for outside eating and relaxing. From the terrace you enter a large living room of 80m² with a small corner kitchen. this is adequately but basically supplied with an electric oven, gas hob, fridge, coffee maker, microwave and double sink. The finish in the living room is simple and colourful. Off the living room is a bathroom (8m²) with walk in shower, hand basin and wc. 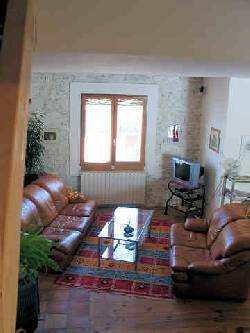 Again off the sitting room are two doublebedded rooms of 15m² each. 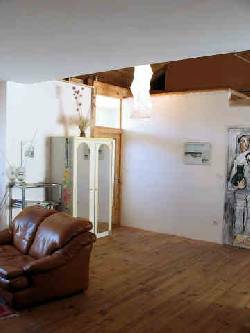 There is also a bedroom at the top of some steep wooden stairs in the living room. This bedroom This bedroom has sloping and limited head height. Down some stairs from the living room and you are in a huge garage . At one end of this is a clothes washing machine.You enter via the 25m² terrace which is furnished for outside eating and relaxing. Down some stairs from the living room and you are in a huge garage . At one end of this is a clothes washing machine.